Freie Fahrt? What does that mean? 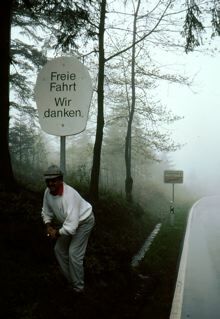 Here's a road sign I couldn't pass up.... A free farht? It was our first trip to Germany, and I don't speak German. What were they trying to tell me? I know this isn't what it was.... but I couldn't pass up the chance to clown around. And to think they thanked me for it! I know it isn't meant to be amusing, but for a befuddled tourist it was. My apologies to the friendly people of Germany. It is obvious this poor guy had too many schnitzels and Tuborgs. It was just a matter of time before he ripped a major hole in the time/ space continuum which we know and call The Black Forest.